The mix of icy snow and pelting rain thwarted my plans to take photos this week. However, I couldn’t resist capturing this traveling splash of color on this raw, dreary day. 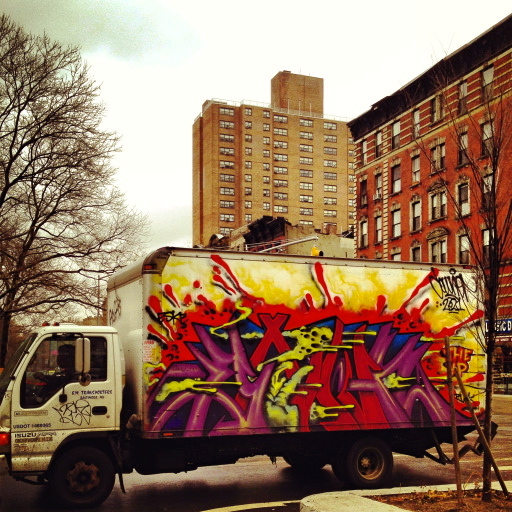 This entry was posted in Dwelling, Hobbies, Lifestyle, Observations, Photography and tagged dreary day, graffiti, hobbies, in the moment, iphone, iPhoneography, motion, motion photography, NYC, pelting rain, Photography, splash of color, street, street art, truck, weather, winter. Bookmark the permalink. thanks, the weather is soon changing, so I can go out more.